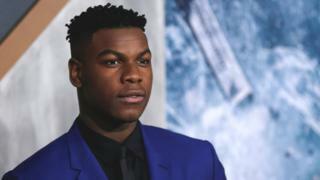 Star Wars actor John Boyega has urged fans of the franchise to stop harassing the cast on social media.His comments came after two co-stars, Daisy Ridley and Kelly Marie Tran, quit Instagram after receiving online abuse.The actor, who plays Finn, tweeted: "If you don't like Star Wars or the characters, understand that there are decisions makers [sic] and harassing the actors/actresses will do nothing. "He then appeared to say he was leaving the site, telling followers: "See ya! "Fans of the sci-fi series have been vocal about recent films' storylines, often directing their views at Boyega. The London-born actor, who appeared in The Force Awakens and The Last Jedi, told followers: "You're not entitled to politeness when your approach is rude. Even if you paid for a ticket!" He later stressed that the vast majority of fans supported the cast and thanked them for "putting yourselves in our shoes", adding: "You understand that there is a process, so much appreciated. "That prompted words of "fatherly" advice from Mark Hamill, AKA Luke Skywalker. "Be careful there son - the last time I let a fan put themself in my shoes, they just took off running & sold them on Ebay," Hamill wrote. Boyega's most recent post reads: "EP 9 loading... see ya!" - referring to the fact he's working on the new Star Wars film. Kelly Marie Tran, who played Rose Tico in 2017's The Last Jedi, suffered racist and sexist abuse on social media. She later deleted all her Instagram posts. But Boyega replied to a message asking why Tran had deleted Instagram by writing: "Kelly is an adult and has made her decision. I haven't spoken to her so I am just as clueless. Just accept that you don't know, as I have. "Ridley quit the platform in 2016 after being criticised for a post about gun violence in the US.